Foie Gras is French for “fatty liver,” and is the fattened liver of a duck or goose. It is fattened by force feeding the bird, which causes suffering for the animal as well as complicated breathing and walking. It is considered to be a delicacy in many countries. Foie Gras dates back to ancient Egyptians, who would take it with them on their trips down the Nile River. Ancient drawings have depicted farmers force feeding their geese. It became a delicacy, eaten by mostly emperors and noble men. During the middle Ages, it disappeared, but made a comeback in the 19th century. It was predominantly made in France, but became unavailable during the 1980s when the Americans banned the import of raw poultry. Because of this, American farmers began making their own Foie Gras. It was even served as the last dinner on the Titanic. Several times a day, the birds are force-fed corn mash through a metal tube so that they gain weight to make their liver ten times its natural size. This would be the same as a 150 pound human being force fed 30 one pound boxes of pasta. The force-feeding starts at the age of 12 weeks and lasts until two to three weeks until the animal is slaughtered. The tube causes injuries to the esophagus of the bird, and causes vomiting and extreme discomfort. In extreme cases it leads to a rupture of the esophagus and leads to the bird’s death from choking on the blood that fills their lungs. Some birds end up literally bursting from the pressure inside of them. Aside from force-feedings, the birds are often neglected and abused with overcrowding, mutilations, and eventually slaughter. They have no access to swimming water which is essential to these birds to remain healthy. Studies show that France produces and consumes around 75% of the world’s foie gras. About 24 million ducks and half a million geese are killed every year for this appetizer. The European Union’s Scientific Committee on Animal Health and Animal Welfare have said, “Force feeding, as currently practiced, is detrimental to the welfare of the birds.” More than a dozen countries have prohibited foie gras production. Herman Lee, owner of La Belle Farms, one of the most well-respected chicken operations in the Northeast, began raising Moulard ducks for foie gras in 2000, after spending several years studying the industry both at home and abroad. La Belle Farms has a red-coated USDA inspector watching their every move every day as the crew gets to work. They are able to process around 500 ducks a day, stunning them in electrified water so they’re unconscious when they’re killed and air-chilled to dry. The air-chilling and drying prevents them from gaining any water weight. Weighing in at around a pound, each liver is roughly the size of a small football. That's close to 10% of the duck's total body weight, and it takes up the vast majority of the lower half of its body. The livers are sorted into two different grades, depending on the amount of bruises and blemishes they have. Any mishandling of the ducks—rough treatment will cause bruising, reducing its price. This gives a strong incentive to be gentle with the birds. Far from the cramped, cruel conditions shown in the videos and photographs, here is an enormous shed, full of birds free to roam as they pleased. La Belle uses and sells every part of the duck except the heads and feet. The birds seemed to show a mild aversion to us, flocking together and giving us a wide berth as we walked through the shed. La Belle shows a mortality rate of around 1% in their ducks, which may seem large, but it's less than 1/5th the mortality of regular chicken or duck farms, and about 10 times lower than the mortality and injury rate of backyard chickens. In another long shed, where the gavage takes place, filled from end to end with 5-foot by 7-foot pens, each one holding about 10 healthy ducks. At La Belle, the ducks are fed three times a day for a total of up to 240 grams of their custom-designed feed. One at a time, a duck is held between a worker’s legs with its neck arched upwards. The worker gently squeezes the base of the duck's neck, then eases a flexible plastic tube down the duck’s throat. A machine whirls, a small bulge forms where the food is deposited, and the duck walks off, giving its head one shake, but otherwise seemingly unaffected. Also worth noting, these ducks do not have a gag reflex. 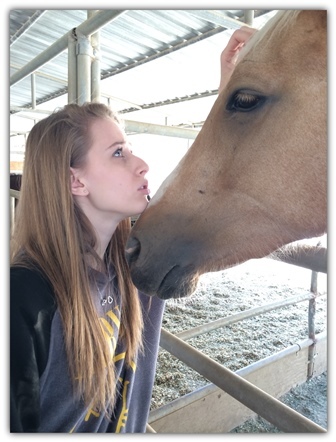 They also breathe through their tongues, so when the tube is down their esophagus they are not being suffocated. When the feeder feels the duck's esophagus, if there's any food remaining, she'll skip that feeding. So while the ducks are technically force-fed, there is a level of built-in anatomical control so that the ducks can't take in any more food than they can physically handle. What Kind of Human Kills Man's Best Friend Like This? Galgos (greyhounds) were brought to Spain by nobleman, so they were held in very high regard. Only the people of high rank could obtain one. After a few decades, they lost their prestigious position and became known as “trash dogs”. David Rosenberg is the editor of Slate’s Behold blog. 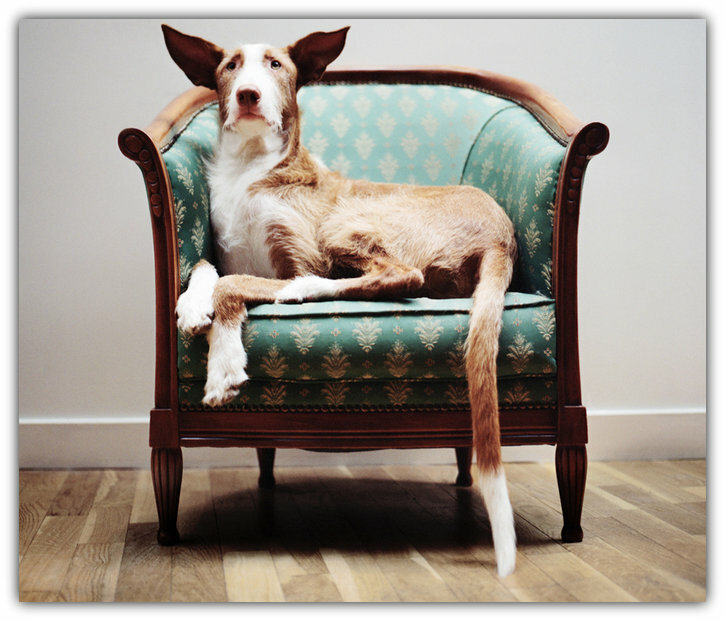 He wrote an article on Mathias de Lattre, a photographer who did portraits of abused greyhounds in their happy, new homes. Roughly 10,000 greyhounds every year in Spain are hanged from trees after hunting season. Another 50,000 are abandoned or living in deplorable situations. Farmers and hunters in the Spanish countryside, where roughly 30 million people live, own these greyhounds and use them for hunting hares and sporting. These poor animals live in deplorable, crude and cruel conditions. Many are crammed in sheds without daylight for days- even up to a week- with very little food and water. Some are kept in the back of vans and have died from heat exhaustion. After a day of hunting, dogs that hunted well might be “rewarded” with stale bread and fresh water. Poor-performing dogs are often left behind in the woods to die or are hung from a tree by its owner. Stemming from a decades-long tradition, hunters hang their hounds from trees. Dogs who hunted well get the ‘privilege’ of being hung from a high branch. Those who hunted poorly are ‘hung low’ so their feet touch the ground, ensuring a slow, tortuous death. They have a name for this form: the "PIANO PLAYER" because the dogs frantically scrabble their legs in a vain attempt to live. David Rosenberg is the editor of Slate’s Behold blog. He wrote an article on Mathias de Lattre, a photographer who did portraits of abused greyhounds in their happy, new homes. We could show you the abused dogs. Or the dead dogs hung from trees. Instead, see what a dog rescued looks like. Please do your part. Speak for these dogs. Ex-hunting dogs are often thrown down wells or abandoned in the woods or streets to die. Some are even burned alive. The methods Spaniards use to kill their dogs are rarely humane. Spain’s national animal protection laws apply to dogs that are pets. But hunting and sporting dogs are NOT considered pets! People are trying to reach out to Spain’s Environmental Minister, Rosa Aguilar Rivero, and asking her to establish hunting dogs as pets as well as banning the inhumane treatment of these animals. Please share this article and tweet and talk about this. Education is key to making changes. Sign petitions. Raise your voice. Do something. Be part of the solution and help end the deplorable treatment of greyhounds in Spain. Video about Greyhound abuse in Spain with Spanish subtitles to be shown at the Spanish Congress of Deputies on March 12th, 2014. Aye-ayes can be found only on the island of Madagascar. These rare animals are related to chimpanzees, apes, and humans. It is the largest species of nocturnal primates. They are dark brown or black and are distinguished by a bushy tail that is larger than their body, only weighing between five and six pounds. They also feature big eyes, slender fingers, and large, sensitive ears. Aye-ayes have pointed claws on all their fingers and toes except for their opposable big toes, which enable them to dangle from branches. Aye-ayes spend their lives in rain forest trees and avoid coming down to the ground. They are nocturnal, and spend the day curled up in a ball-like nest of leaves and branches. The nests appear as closed spheres with single entry holes, situated in the forks of large trees. When moving, Aye-ayes either build new nests or take over old ones. While perched aloft, the aye-aye taps on trees with its long middle finger and listens for wood-boring insect larvae moving under the bark. It employs the same middle finger to fish them out. The digit is also useful for scooping the flesh out of coconuts and other fruits that supplement the animal's insect diet. Their eating habits tend to change with the season to accommodate what kind of food is available. These adaptations to make their feeding habits easier are what makes them very unusual looking. 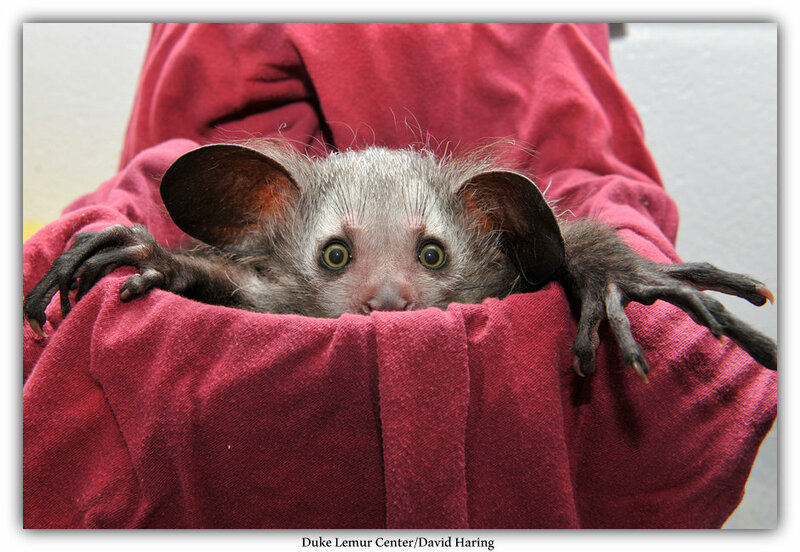 Aye-ayes have no fixed breeding season. The females have distinct mating calls that they show off when they’re ready to mate, which leads many males to surround her and fight for their right to mate. A single offspring is born after a gestation period of only six months. 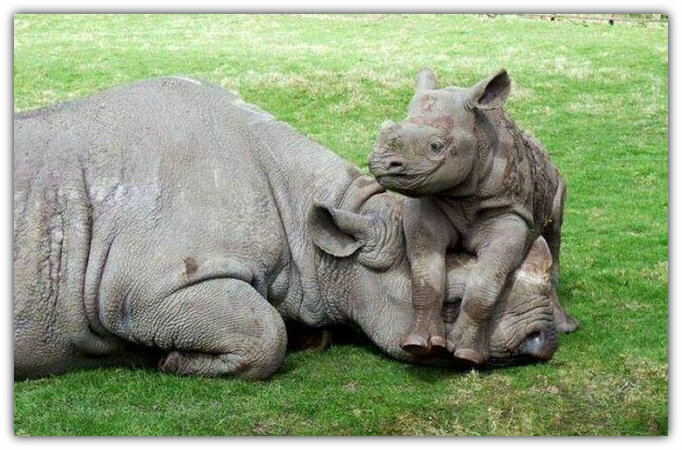 After a female has her offspring, she will wait around three years to mate again. 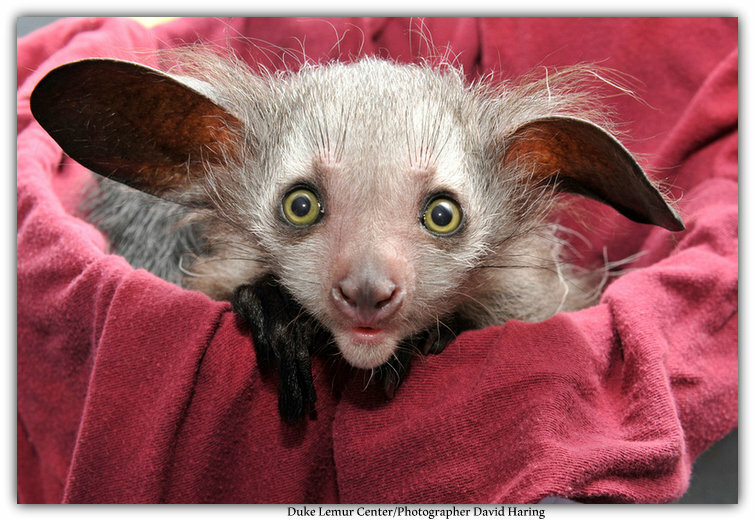 Many people native to Madagascar consider the aye-aye an omen of bad luck. They believe that if their long, skeletal middle finger is pointed at you, you are cursed to death unless you kill the aye-aye as quickly as possible. Another myth is that these creatures sneak into villages at night and use their middle finger to stab locals in the aorta. For this reason they often have been killed on sight. 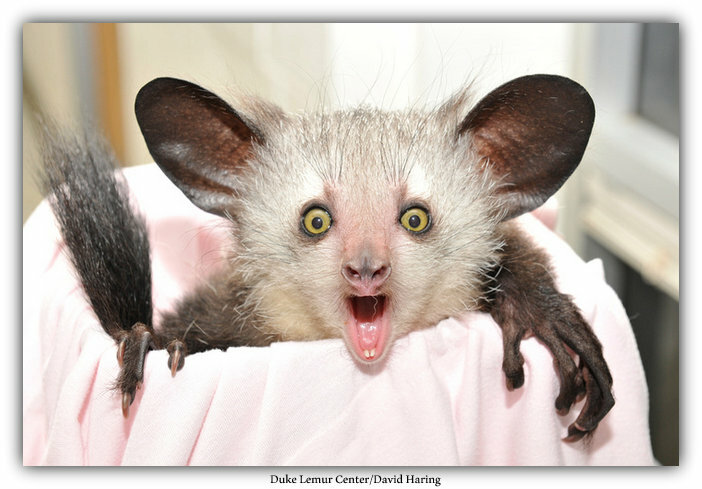 Such hunting, coupled with habitat destruction, has made the aye-aye critically endangered. Today they are protected by law, but their numbers are still decreasing. 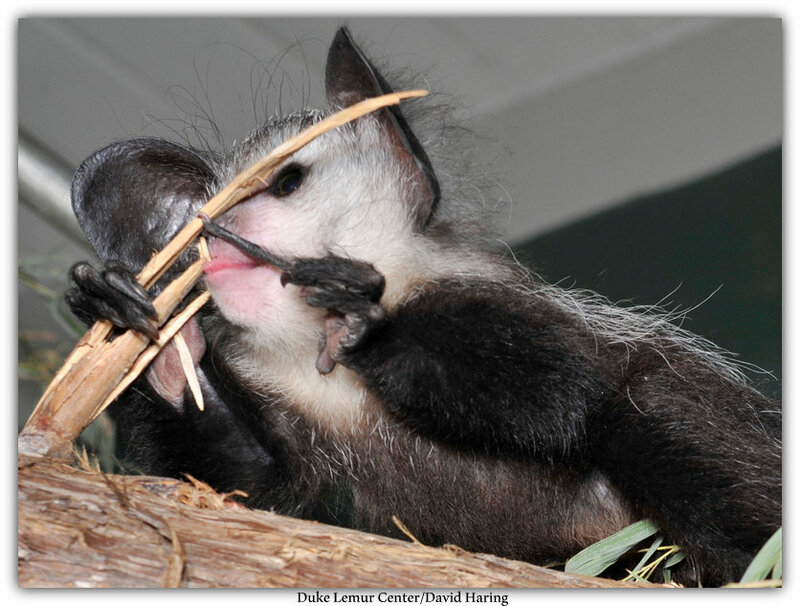 The total population of the aye-aye is currently unknown, but is estimated to be between 1,000 and 10,000 individuals. and what you do not know, you will fear. What one fears, one destroys." In the years 1850-1900, more than one million wolves were killed because of superstitious beliefs in Europe and surrounding countries. That’s equivalent to almost 550 wolves killed daily. These superstitions included the devil, healing powers, good fortune, and good luck. One of the most famous superstitions about wolves is the idea of a werewolf. A werewolf can be described as a human being who has changed into a wolf, or is capable of assuming the form of a wolf, while retaining human intelligence. They are imagined to have incredible strength, as well as nocturnal vision and an increased sense of smell. They are immortal and can regenerate flesh. This may be where the superstition of wrapping yourself in wolf hide will stop you from having seizures came from, as well as rubbing a wolf’s tooth on a baby’s gum to alleviate tooth pain. Another common superstition about wolves is that they were either created by the devil or they’re the devil in disguise, yet ironically people used almost any part of a wolf to ward off bad spirits. It is said that having a wolf head under your pillow will keep bad dreams away and eating wolf’s meat would ward off seeing ghosts. Norse mythology also claims that the sight of a wolf and raven together foreshadows good fortune in battle. Wolves were also used as healing medicines. In Europe during the Middle Ages, wolf liver was used to reduce the pain of childbirth and a wolf’s right paw would be tied around a sore throat to stop the swelling. Another common remedy was the meat of the wolf to cure sore shins. These superstitions may seem silly to our generation, but it was so commonly believed that almost all of the entire wolf population was wiped out because of these beliefs. Gray wolves are still endangered to this day, and a large percentage of that killing had to do with people’s superstitious beliefs. Luckily, some people revered wolves, which may have contributed to saving them from extinction. 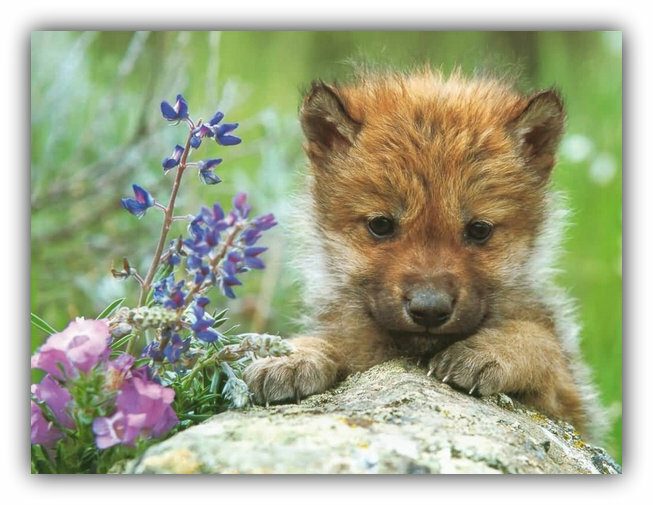 These life saving beliefs viewed wolves as wise and powerful, and worth protecting. 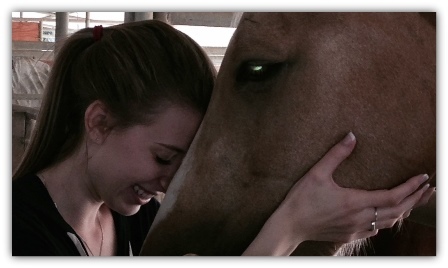 People saw them as an instinctive hunter, and a teacher.